This article may not be reproduced in any form without prior permission. Make sure those outings to the beach or horse show become treasured memories and not nightmares. Neil Clarkson offers some advice for safe floating. Towing a horsefloat is not without risks. A pleasant outing for horse and rider can turn into the day from hell if things start going wrong. It's impossible, of course, to eliminate every potential problem, but it's surprising how many factors we do have control over. By applying a little common sense and knowing how to deal with some of the problems, we can greatly reduce the chances of disaster. A worrying number of serious road accidents result from tyre blowouts, regardless of whether a float is involved. People, not roads, play the biggest part: A worn tyre is many more times more likely to suffer a puncture than one in good condition. Overseas studies indicate that 75 per cent of blowouts are caused by under-inflation, which can cause dangerous heat build-up in a tyre. It will also cost you money in extra tyre wear and extra fuel consumption, and will affect the way your float is tracking behind your vehicle. Are you running your float on car tyres? A tandem-axle float may weigh more than two tonnes with two horses on board. It's much safer to run on light truck tyres than car tyres. Light truck tyres are built tougher and are designed to take bigger loads. 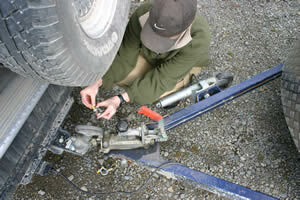 They're more expensive, but your chances of a puncture or blowout will be greatly reduced. They should carry an "LT" marking. Car tyre or light truck tyre? 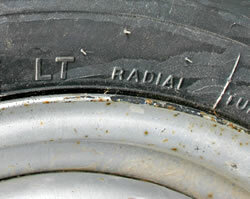 Light truck tyres should carry an LT marking. Under-inflated tyres not only increase the chance of a dangerous blowout, but also ruin your fuel economy and raise the risk of fishtailing. A British study found 75 per cent of blowouts were caused by under-inflation. The same study found that one in four tyres were at least 10 per cent under-inflated, meaning there's a pretty good chance that one of your float tyres will need air right now! Check your tyre pressures regularly (always when the tyres are cold), and inspect the tread area for stones and other foreign objects that can cause damage. Check the sidewalls (inside and out) for cuts and bulges, both of which can spell trouble. Don't forget to inspect your spare. While you're at it, check that all the wheel nuts are tight. Should you suffer a blowout, it's important to avoid jumping hard on the brakes. The response of your vehicle will depend upon which tyre goes, but most likely your vehicle will lurch left or right. This can be quite violent if you're in a four-wheel-drive with high-sidewall tyres. 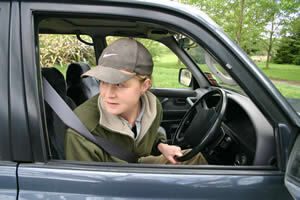 Maintain a firm grip on the steering wheel and try easing the vehicle and float gently off the road. Lose speed gradually - you can change down through the gears - and come to a stop. If you must steer to control a slide, turn gradually in the direction of the slide. If you're able, flick on your hazard lights as soon as possible to warn other motorists of a problem. Finally, if you don't use your float much, it's possible you may have bought those tyres off Henry Ford himself. Rubber perishes with age, so if you reckon the tyres are over 10 years old, get your friendly tyre centre to check them. 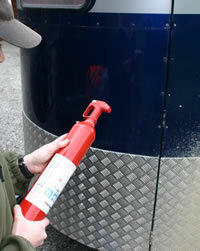 A dry-powder fire extinguisher is an important addition to your travelling kit. 2. Fire! Just because horses don't play with matches is no reason to forget about carrying a fire extinguisher. The most likely cause of fire in a float is overheated brakes, either through leaving the handbrake on or through them locking on while in transit. The greatest risk with hydraulic brakes is when you're facing a long downhill stretch, which can make the brakes engage. Brakes can generate tremendous heat so the risk is very real. There's plenty of wood in most floats, and that bale of hay in front will burn pretty well, too. A dry powder extinguisher should cover most eventualities. Be familiar with its operation and have it checked or replaced at the recommended intervals. They're no good on cooking-oil and fat fires, so if you have built-in accommodation and regularly enjoy fry-ups, you may need an additional class of extinguisher. All will be clearly marked. Be systematic. Never do half a hitching job. When the float and towing vehicle come together, hook them up there and then. How many people have driven to an event only to find they left the lever across which allows you to reverse without the brakes locking? Or taken off with the foat handbrake on? Connect the coupling to the ball and check it's locked into place. Ensure the reversing lock is disengaged and the float handbrake is off (unless you're on a slope). Connect the electrics and have someone check the lights. Connect the safety chains. Two are much safer than one. If you have two, cross them over underneath the coupling. 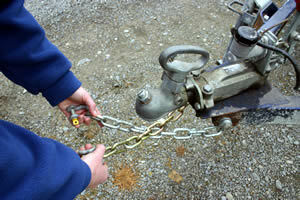 This means, if the float comes off the ball, the chains will catch the towbar, much like a cradle. With one chain, you don't want the front of a disconnected float digging into the road lor it could flip, so make sure your chain length is just right. You also don't want chains that are so short they prevent turning. When you head off, quickly re-check the coupling after a hundred metres or so to make sure everything is working as it should. Re-check everything before you begin the journey home. Check and double-check when you hook up your float: Coupling properly on and locked in place, chains connected, electrics hooked up and lights checked, float handbrake off, and the reversing lock disengaged. If you have two chains, cross them over beneath the coupling, but be sure there is still enough slack to allow for cornering. Crossed chains are able to "catch" the float if it comes off the ball. Fishtailing is one of the scariest experiences you're ever likely to have when towing a float. It's effectively a case of the tail wagging the dog: the float begins swaying from side to side, pulling at the towing vehicle. If you're unable to control it, the float is likely to overturn, pull you off the road, or you'll jack-knife, possibly sliding into the path of oncoming traffic. You need to bring a fishtailing float under control gradually. Hitting the brakes hard is likely end in an immediate jack-knife. You need to gently lose speed by easing off the accelerator while trying to keep the towing vehicle in a straight line. Do not attempt to "correct" a fishtailing float by steering. This is likely to make the problem worse. Concentrate on staying straight and losing speed. Once you begin to slow the float should fall back into line. You then need to address the root cause to prevent it happening again. There are several factors, or combinations of factors, that contribute to fishtailing - and it may not be the float at fault. You could have been driving too fast. It could be that your vehicle's wheelbase is too short, its suspension too soft, or it's simply too light for the float. It's possible you've loaded the float poorly, with uneven weight distribution, or that you're carrying too much weight too high. The float suspension could be too soft. Mismatched tyres and uneven inflation can often play a part. If your vehicle-float combination has a habit of beginning to fishtail, it's time to start looking at whether you have the ideal combination. But remember, no matter how well you are set up for towing, fishtailing is an ever-present threat. A tyre blowout, wind gust, or moving horse could be all it takes to set up this dangerous situation. You don't need a lot: some screwdrivers, a crescent spanner and pliers. Your vehicle's standard tool kit may suffice, but check. Add a hammer, some strong tape, a good torch, and a reflective vest for any roadside dramas (and riding). Carry a spare bulb for your float lights. The tools are not just for running repairs, but may be crucial in getting your horses out of a float in an emergency. Consider it your very own Batphone. Use it in an emergency. If you've been in an accident, emergency personnel may not know how to handle horses and you might be in no condition to help. Use it to summon friends who can. A kit for you, and a kit for your horses. Most horse owners are likely to leave home with the stuff to cover every eventually for their horses, but not for themselves. If you don't have a good first aid kit permanently in your vehicle or float, ask Santa for one this Christmas. 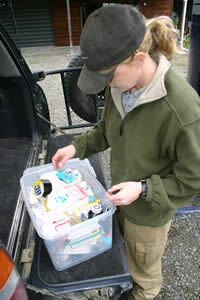 A first aid kit for your horses ... and don't forget one for you. Stick to the 90kmh speed limit, or slower if traffic and road conditions dictate. Some float owners will not exceed 80kmh. Increase following distances because, aside from the longer stopping distances caused by the extra weight, who wants to slam on the anchors with horses on board? Keep looking ahead for potential hazards and adjust your driving accordingly. Take corners wider, or your float will collect the kerb and frighten the horses. Try to avoid braking through a corner, as it could jack-knife the float. Brake gently while still going in a straight line and slow to a speed that you can take the corner at without further braking. A good rule of thumb is not to change speed and direction at the same time. Be courteous and let faster traffic pass when you safely can. Use a lower gear going downhill so you use the engine as a brake. This will reduce the amount of foot-braking necessary and minimise the chance of overheating. Remember: hot brakes are inefficient brakes. If your side mirrors are ineffective with the float hitched up, invest in an extension mirror. You're best to have someone out spotting for you. Reversing is never much fun, but practice makes perfect. If you're always forgetting which way to turn the wheel, apply this technique: Place your hand at the bottom of the steering wheel. If you want the rear of the float to go left, move your hand in that direction. If you want right-hand movement, go right. A backing tip: Place your hand on the bottom of the steering wheel. If you want the back of the float to go left, move it left. If you want it to go right, move it right..
A well-maintained float is not much good if the towing vehicle expires during the outing. Towing a float puts extra loads on the engine, the transmission, the brakes - just about every moving component. The byproduct is usually extra heat, so ensure the engine oil, coolant, brake fluid and transmission oil are topped up and not overdue for a change. Make sure the radiator cooling fins are in good nick and not clogged. Check the rubber hoses of the vehicle's cooling system regularly as these deteriorate with heat. Keep an eye on the temperature gauge when you're on the move, and watch for any sudden changes. 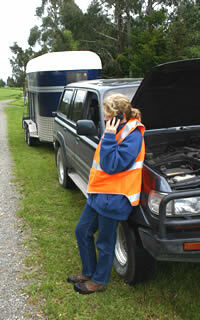 Is your horse trailer / horse float an accident waiting to happen? Towing a horsefloat - have you got it right? What's the best second-hand vehicle for towing a horse float?